RESTORE™ Bolivian Quinoa is delicious with Crispy Baked Chicken. This recipe will show you how to prepare a delicious chicken dinner for 4 people. AND IT ONLY TAKES 15 MINUTES! 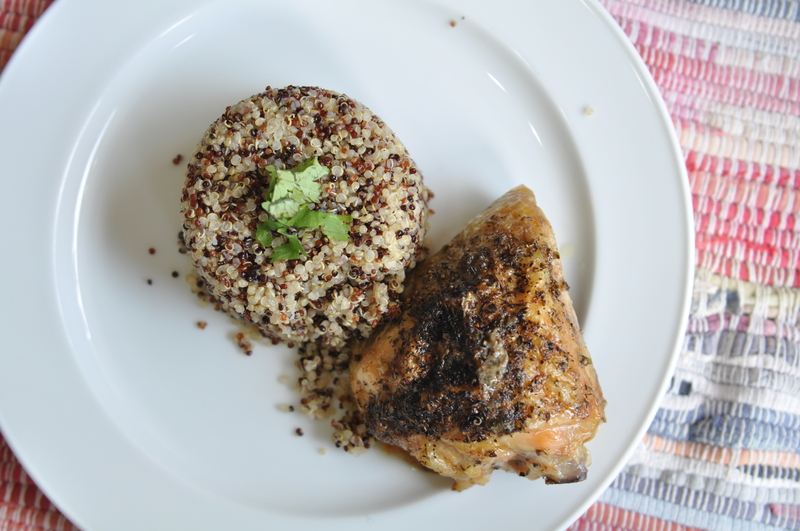 Once you’re done, you’ll be enjoying a crispy-skinned, moist chicken that’s goes DEE-LICIOUSLY with the warm, nutty quinoa. Perfect as a complete family dinner especially if you make it with our Clear The Fridge vegetable recipe. At Step 6, if the chicken is still undercooked, bake for another 5 minutes. 2) As the oven heats, mix olive oil, sesame oil with salt and black pepper. 3) Arrange the chicken in a pan and spoon the marinade onto the chicken. 4) Next, sprinkle the Italian herbs on to the chicken. 5) Pop the open pan into the pre-heated oven and cook for 45 minutes. DO NOT COVER! 6) After 45 minutes, remove the chicken from the oven. 7) Serve with hot RESTORE™ Bolivian Quinoa. 8) Grab a spoon and fork. ENJOY! !